Nominated for the 2014 Saltire Society Poetry Book of the Year Award. ‘The slings and arrows of life are challenge enough and Williams celebrates all of our strengths in her poetry. Just as her words are rich with life and love, they’re also critical, and address the harsher blows of living. The poet refuses to shy away from the realities of life and instead accentuates their role in shaping us, and gives time and focus to the processes of recovery. Williams channels a sense of everything having a purpose in her poems, and she closes her collection with the haunting, thought-provoking return of the Heron. The heron has a dream of blindness. the feeling of the fishes brushing his legs. Locust and Marlin considers how, in lives bright and brief as a candle’s burn, we tell our stories and locate the places where we live and love. Where is the origin, our point in space from which we view the world? How much control do we have over who we are and what impact we have on the territory we inhabit? In a world whose boundaries and pathways are increasingly difficult to define, how do we find our way home? 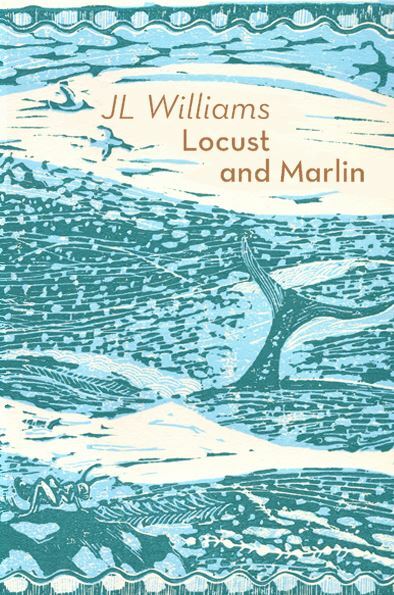 Listen here to a Scottish Poetry Library podcast about Locust and Marlin. JL Williams reading at Main Point Books, August 2014. Cover Image by Anupa Gardner, with many thanks.